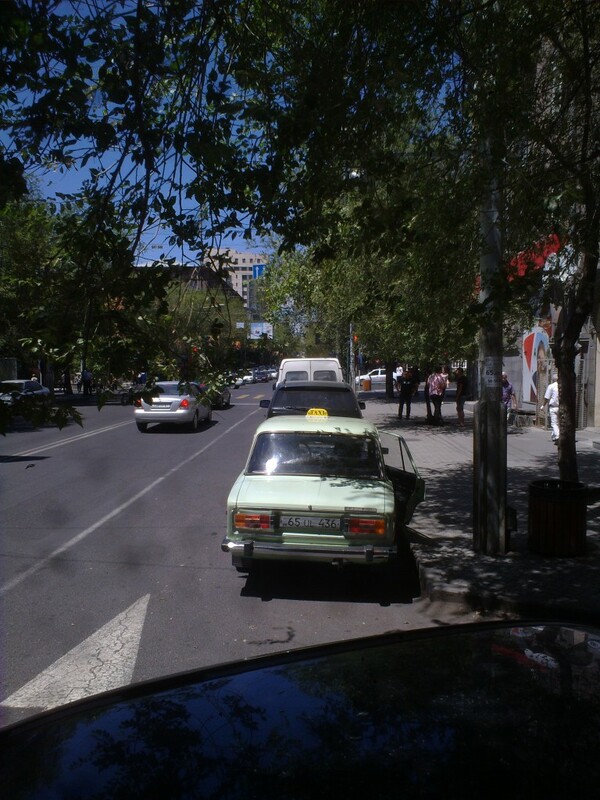 This taxi managed to park in a spot where he could be out of the camera’s view. I must have been parked just in front of his space. So several factors exist here, all comprising a not-so-elaborate plan to make money. It took me a few days to work it all out, granted, but it doesn’t take a genius. First, as I stated above, there is no sign or painted lines for that matter indicating that the spot is a no-parking zone. Apparently motorists are simply expected to know about the illegality, as it should be obvious according to the explanation given over the phone. Second, it isn’t necessary to have two lanes there since there is no left turn onto Nalbandyan Street for some strange reason since it’s been a two-way thoroughfare for over a year now to address traffic issues. I suppose the logic is to have a separate lane for cars turning right, but the traffic is never heavy on that part of Tumanyan Street anyway. Third, the fine is 5,000 dram, about $13. A camera is perched on the pole aimed directly on that zone. The only ways to contest the violation is to either go to court, or make a stop at the traffic police station and have a chat with one of the chiefs responsible for recording such infringements of the law, which of course would only balloon into a full-blown argument peppered with fiery insults, pledges to take the pain away and swearing on the life of one’s own father or mother. And for only 5000 dram, no one is going to bother to waste the time to do either during a workday.